Gambling games using spinning wheels have been played for thousands of years. Some of the earliest games using spinning wheels date back to Ancient Rome and Greece. Roman soldiers would mark sections on a chariot wheel spin it and bet on where it would stop. In Ancient Greece, the same principle was applied to shields that were marked with sections and spun on spears. The horizontal spinning wheel that forms the basic equipment for the game of roulette is thought o have been invented by french mathematician, Blaise Pascal, in the 17th century. He was experimenting with perpetual motion devices. The wheel is though to have been a result of these experiments. Roulette wheels are mounted on a spindle and, a small push of the wheel is enough to keep the wheel spinning for a length of time. Inside bets have the highest payoff and highest rick. A Straight up bet on one number has a 1:38 chance of winning. A payoff equal to the true odds (zero house edge) would be 37:1, our thirty seven times the wager. 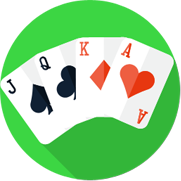 Split bets are made by putting a wager on the line between two numbers. Either number can be a winner. The casino pays 17:1 on split bets. A true odds payoff would be 18:1. That worked out to a house edge of 5.26%. 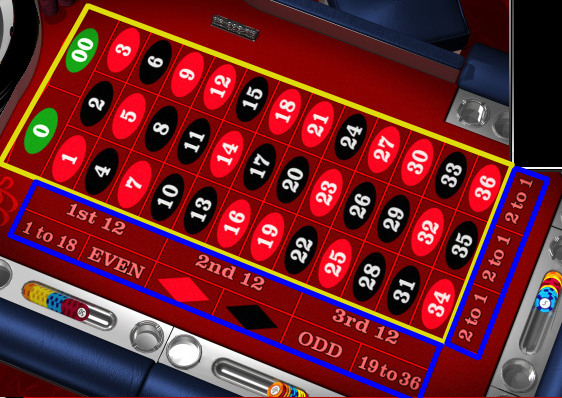 Six-Number bets are placed on the intersection lines at the end of the two rows. They pay 5:1. Bets on the outside of the layout are less ricky, but they pay less. Betting a group of twelve 1-12,13-24 or 25-36 pays 2:1. 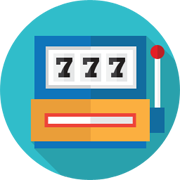 Your can also bet a column of twelve numbers for the same payout. The rest of the outside bets pay even money 1:1. They are red,black,1-18,19-36, even and odd. The yellow box represents the Inside betting area. The blue box represents the Outside better area.